In my opinion there are few better feelings than walking on a hot summer’s evening down towards the Big Top for Live @ The Marquee. Over the past few years I’ve been lucky to see some of my favourite bands and artists and all within a five minute walk of where I grew up. Tonight is the first of this year’s music gigs and performing is this year’s winner of the Grammy for album of the year Beck. Opening for Beck tonight were O Emperor, a five piece from Waterford who have been responsible for some of the best Irish singles in the last few years. ‘Po’, ‘Contact’ and ‘Switchblade’ have all threatened to launch O Emperor to superstardom but sadly for them they never seem to reach the heights they deserve. Although tonight’s performance, it has to be said, was not the best I’ve seen from them. Sound issues with instruments and the keyboard player’s vocals detracted from what was otherwise a very solid set. A set which included a new track called ‘The Sky is Your Oyster’. The highlight for me was a powerful version of ‘Switchblade’. 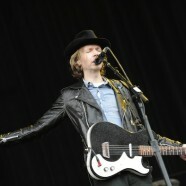 Beck arrives onto a fog cover stage and waves to the crowd before grabbing a guitar and getting instantly down to business. Wearing what has now become a trademark wide brim hat and leather jacket he looks a little like an Amish boy who left for Rumspringa and ended up joining a rock band. Anyone who may have thought that because the 2015 Grammy winning album ‘Morning Phase’ had been a mellow affair we were in for a quiet evening would have been forgiven for thinking so, but when the set opened with ‘Devils haircut’ and was followed up by ‘Black Tambourine’ and ‘New Pollution’ it was evident mellow was not on Beck’s mind tonight. ‘I Think I’m In Love’ cleverly morphed into a cover of Donna Summer’s disco classic ‘I feel Love’ to further reinforce that Mr Hansen wasn’t here for a mellow evening. It’s actually not until the eight song of the night ‘Blue Moon’ quickly followed by ‘Your Heart Is A Drum’ from the current record that the foot is taken off the gas for a little while. There was plenty of old classics tonight and it appeared as he danced energetically around the stage that Beck was getting just as much enjoyment from playing them as his audience were from listening. ’Loser’,’Sexx Laws’,’E-Pro’ and ‘Gamma Ray’ all bring roars of delights from the sadly nowhere near capacity crowd. When the night is drawing to a close Beck seals off the stage with some police crime scene tape but I can assure you that the only crime committed here tonight is that there wasn’t enough people present to see this excellent performance. The crime scene is lifted once again when Beck and his excellent band return to the stage for an encore which consisted of a marvellous rendition of ‘Where It’s At’.